Are you one of the many who love Farm Town, FarmVille, Barn Buddy and some other farming games on Facebook? If you are, then you might also love the cute iFarm app on your iPhone. 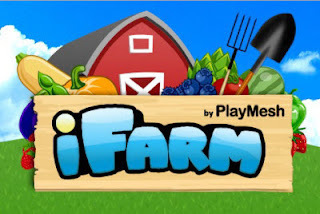 This iFarming-on-the-go is brought to you by PlayMesh and you can download this app for free. 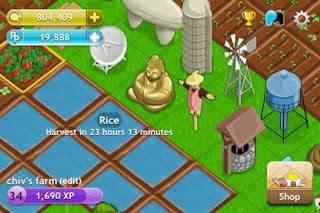 Just like in all of the Facebook farming games, you will be given a certain amount of coins to begin your career as an iFarmer. There's an empty lot for you to plow, plant the seeds of your choice, wait for hours or days until the crops are ready for you to harvest, sell them and earn more coins! When you have enough coins, you can already buy farm decorations and buildings to make your iFarm look a lot better! A friendly reminder: this iPhone app's addictive so be prepared to get hooked on it! What are you waiting for? Get your thumbs into iFarming 24 hours a day... wherever... however you want it! This is one cool app you don't want to miss! Enjoy! Hello hello! I used to be a virtual farmer but my schedule couldn't take any virtual farming in at the moment. maybe next time i'll be back to virtual farming. hopefully!